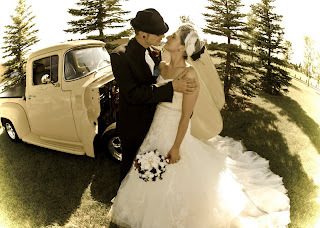 The third and final wedding of 2011 that I was in was for my cousin's wedding this past weekend in Edmonton, AB. This was the only wedding where all the bridesmaids had the same dress. I emailed my cousin pretty much as soon as I found out I was pregnant to find out if I could make my own version of the dress that would allow room for my growing belly. She said it was fine by her. I only had about 3 days to make the dress - we were away for 10 days at the last wedding, and then I was working pretty much everyday before leaving for Edmonton. So it was a bit stressful... luckily it was a much simpler dress to make than the Love Is In The Air (Part II). The wedding had a 1940s vibe, and I was so lucky to have had Garrett at Grateful Head in Edmonton do my hair for the day. He said he has done tons of hair and makeup for local theatre companies and 1940s is pretty much his favourite theme ever. I just said "go for it!" so I ended up with fabulous rolls and curls - I felt like I stepped right out of 1946. I loved it. The red lips and winged eyeliner completed the look. My cousin looked amazing in her dress, and her birdcage veil was to die for. All in all, it was a fabulous day. It was nice to see my family again since we don't get together very often... We are too spread out across the continent! Hope you all had a lovely weekend as well. In Desperate Need of Clothing!